WakeMeUp! 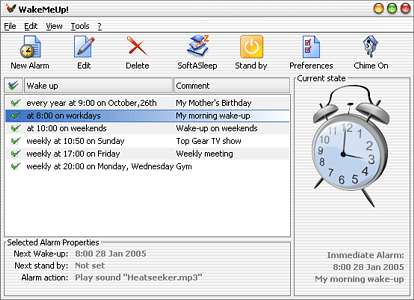 is an advanced alarm clock for computers with Windows 2000, XP or Server 2003. It can gently wake you up, notify you about an event, play chime at the beginning of an hour. A fade-out timer will help you to fall asleep and will put your PC in sleep mode when done. All these features turn WakeMeUp! into a complete PC scheduling system. WakeMeUp! is built on its own scheduling engine. Therefore it doesn't depend on Windows Task Scheduler service and is free from its limitations, such as uncomfortable alarm configuration or the need to provide a login/password to enable its RunAs capabilities. Follow this link to get more information on WakeMeUp! architecture. In S3 your computer makes no noise at all in spite of all programs stay in memory. That's why it is also called "suspend to RAM". The energy consumption in S3 mode is extremely low, so don't hesitate to use it instead of Power Off. WakeMeUp! fires alarms without being started, because it has a special Windows system service that is responsible for alarm management, notifications, resuming from Stand By etc. There's no alarm you can't set-up with WakeMeUp! Extremely flexible alarm set-up with 9 frequency modes that enables you to create as many alarms as you want. You can create a very sophisticated alarm in a couple of clicks! WakeMeUp! works even when there're no users logged on, e.g. after system reboot caused by power failure. Almost any sound file can be played as an alarm notification. WakeMeUp! has a fade-in function that gently increases volume at alarm notification. Tired of waking up to the same music every day? WakeMeUp! can playback Internet radio stream. It can automatically establish the connection you specify and play 'reserve' sound file if radio stream cannot be accessed for some reason. There are about 30 stations you can choose from. 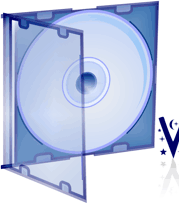 You can specify any additional radio station by providing its playlist file (.pls) URL. Designed for people who like to fall sleep to their favourite tunes, TV, video etc. As it works, the volume is gently decreased. When the time is over, it can put a PC in StandBy mode and/or terminate the process you specify. WakeMeUp! can play any MP3,WMA,OGG or WAV at the beginning of every hour. You can start any program or open a file as an alarm notification. WakeMeUp! can also put your PC in StandBy mode, so you can create your own automation schedules. If the owner of alarm is logged on, WakeMeUp! runs a program using his (her) account. Otherwise a Local System account is used. An example of such schedule can be a recording of a TV program late at night or when you are not at home. WakeMeUp! has 5 built-in skins. You can download additional skins from our server. For now, WakeMeUp! is completely translated into English, Russian, Italian, Spanish, Portuguese, Danish, German, Korean, Romanian, Chinese and Serbo-Croatian. Please visit this page, if you'd like to translate it into your native language. Click here to download WakeMeUp! right now.